No label had more reason to celebrate after the Grammys in New York last night than Atlantic Records. Bruno Mars’ clean sweep of the evening’s biggest three prizes – Song Of The Year (That’s What I Like), Record Of The Year (24K Magic) and Album Of The Year (24K Magic) – added to a total haul of 13 trophies for the Warner Music company. The result is the latest milestone in something of an unbroken purple patch for Atlantic. It was the biggest label in the US last year – with a 12% streaming marketshare. In many ways, Bruno Mars’ 24K Magic album is a prime example of how Atlantic – in the words of COO and Co-Chairman Julie Greenwald, “signs stuff that we love, however long the road is going to be”. 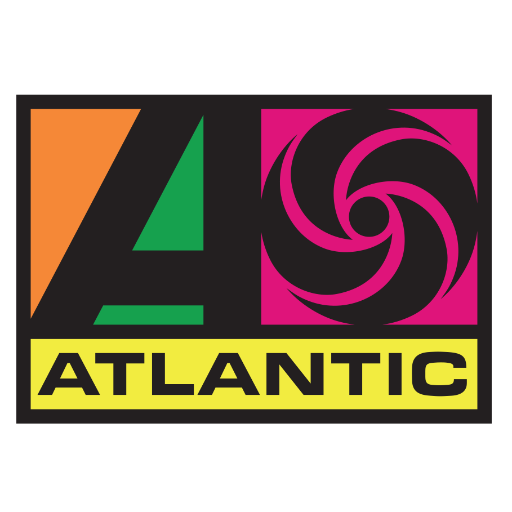 The double-platinum LP, which was honored with seven Grammys in total, has been patiently promoted by Atlantic ever since its release all the way back in November 2016. 24K Magic’s fifth single, Finesse, is only now being hyped by the label, a full 15 months after the album’s first single, That’s What I Like, arrived. Finesse has been newly-buffed up for 2018 with a feature from hip-hop star Cardi B – the latest touch in a committed A&R process led by Atlantic CEO (and Greenwald’s co-Chairman at the label) Craig Kallman. Other standout successes at Atlantic over the past 12 months include fellow Grammy winners such as Portugal The Man, who have broken through on their eighth album, and War On Drugs, who released their first major label record via Atlantic in August last year. The label has also followed up on the record-breaking success of Hamilton by doubling-down in the contemporary Broadway scene: last night, breakout show Dear Evan Hansen picked up a Grammy for Best Musical Theater Album. It was produced by Pete Ganbarg, who was recently promoted to President of A&R at Atlantic. 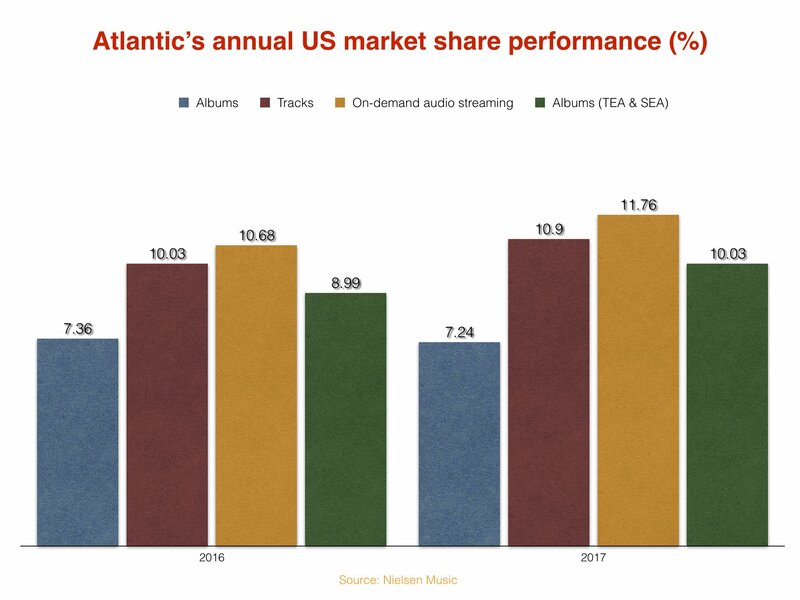 According to Max Lousada, global CEO of Recorded Music for Warner, Atlantic’s transatlantic team offers artists a marked difference to other labels. “Julie and Craig’s ability to have clear and direct conversations with talented artists to achieve better outcomes is really impressive,” he tells MBW. Of course, at one stage of the Grammys build-up, you could have been forgiven for assuming that Atlantic wasn’t set for a particularly spellbinding night. 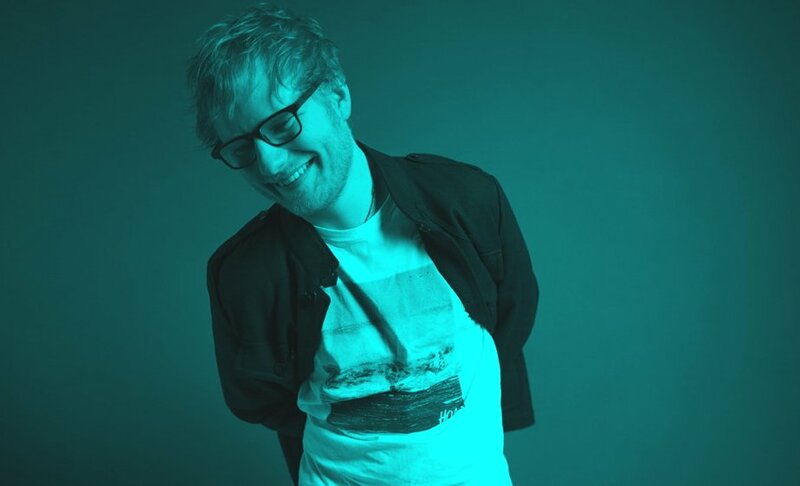 British megastar Ed Sheeran got passed over for a nomination in the big three categories (Record/Song/Album), despite releasing the biggest album in the US last year with Divide – and breaking all time Spotify records with lead single, Shape Of You. Sheeran still picked up Grammy wins yesterday, however, in two categories: Best Pop Vocal Album and Best Solo Pop Performance. Happily for Greenwald and Kallman (pictured, main), these victories added to a historic evening for Atlantic, which capped off a remarkable run of form on both sides of the Pond. What’s your immediate reaction to 13 Grammy wins? Julie: Craig and I are beyond super-excited – but so is the whole staff at Atlantic. To be in a suite with 22 of our employees last night, all high-fiving each other, was the biggest morale builder on the planet. We had a giant pizza party today and everyone was walking tall, knowing what they contributed. Our artists won in so many different categories, every piece of this building is celebrating. The TV audience was down yet again, this time by over 6m. How much value is there still in winning a Grammy? Craig: Alessia Cara said [on stage] that she’d been practicing for her acceptance speech from a young age. That was emblematic of how so many artists and executives in the music business see the Grammys. They are the biggest awards in music, just like the Oscars or the Tonys. Julie : We got to celebrate last night with Bruno, and you could see in real time the value of a Grammy. He wasn’t on cloud nine – he was on cloud 50. We know how long it took him to craft this album. He worked so hard because he wrote it and produced it. Portugal The Man, War On Drugs, the Dear Evan Hanson dudes – they’re all on cloud 50. There’s still huge value for the artists when they win these awards. There is a lot of discussion today about whether the Grammys really captured the issue of gender parity, in the era of Time’s Up and #metoo. What was your take? Julie: I think what Janelle [Monae] did was incredible and I’m super proud of her. She’s an amazing, outspoken young African American woman. Sometimes it’s scary to stand up and say things that might rub certain people up the wrong way, to be ‘political’ when you just want to be an artist; but she’s more than an artist, she wants to affect change and have a good impact, not just on culture but on the whole system. Janelle looks at the music business and wants to change it for the better. We’ve had lots of conversations recently about, ‘Why aren’t there more female producers, female engineers, female songwriters?’ We talk about the fact that if we had more female engineers and producers maybe the studio environment would be a more welcoming place for young women. How can we help change that? I was telling Janelle about our engineer here in Atlantic studios, Ebonie [Smith], who runs this organization called Gender Amplified, which teaches young women about becoming an engineer or producer. So I was super-proud of Janelle for standing up there at the Grammys and speaking out about what a lot of us are feeling. Also, the Kesha performance was a big moment for the discussion around sexual harassment. Time’s Up is bigger than just sexual harassment, of course – that’s just one piece of the puzzle. As for the Grammys themselves, at least they acknowledged the issue. It’s not the Grammys that needs to change this industry – it’s all of us. The Grammys is just one night that can bring some attention to a lot of issues that need tackling. The important thing is what are we all going to do after the Grammys. An impossible question: What gave 24K the edge over – arguably – the two albums pundits saw as the favorites, hip-hop records from Jay Z and Kendrick Lamar? Craig: I can’t get in the mind of all the voters! There was terrific competition from the formidable records you mention and elsewhere in the categories. We believe that Bruno made such an extraordinary album – a creative, imaginative and exciting body of work. Julie: This album [24K Magic] is going to be streamed forever; his last two albums still stream like monsters. That’s the beauty of streaming – artists get paid for the rest of their lives. It’s a completely classic party album that is unique to Bruno, and his performance last night was exceptional. Why has Atlantic ultimately won all of these Grammys. What’s the magic potion? Julie: There is no magic potion. We just had such a banner year. Listen, last year, Columbia cleaned up with Adele and Beyonce. They took home like 97 awards. It moves around the industry and thank God it does; we all get our due. We were firing on all cylinders this year in every category. I feel like we won the Superbowl in 2017, and we collected our rings last night. But that always moves around. How did you feel about Ed Sheeran not being nominated in any of the ‘big three’ categories? Julie: I was both personally and professionally disappointed, hurt and angry. I went through a thousand horrible feelings. Here’s a guy who worked so hard all year long, had the biggest song of the year and the biggest album of the year. It seemed so personal not to get the nod for even one of the three. Ed got two other Grammy nominations and won, but [the lack of big three nominations] felt weird. The entire universe came out and said, ‘What happened? !’ So I know I wasn’t alone in that opinion. Everybody I bumped into in the industry felt like he kind of got robbed. It’s not like he had a medium-sized song: he had the biggest song in the world, and the No.1 album in the United States. As I say, weird. 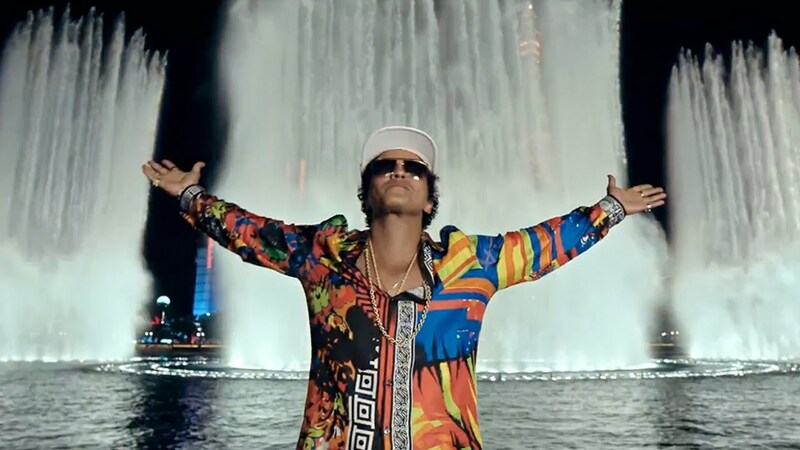 But at the same time, I was so happy and excited for Bruno. I’m a parent, [Ed and Bruno] are my two sons: I was devastated for one of them, and delighted for the other one. But hey, Ed won two Grammys last night – I can’t wait to give him a hug. 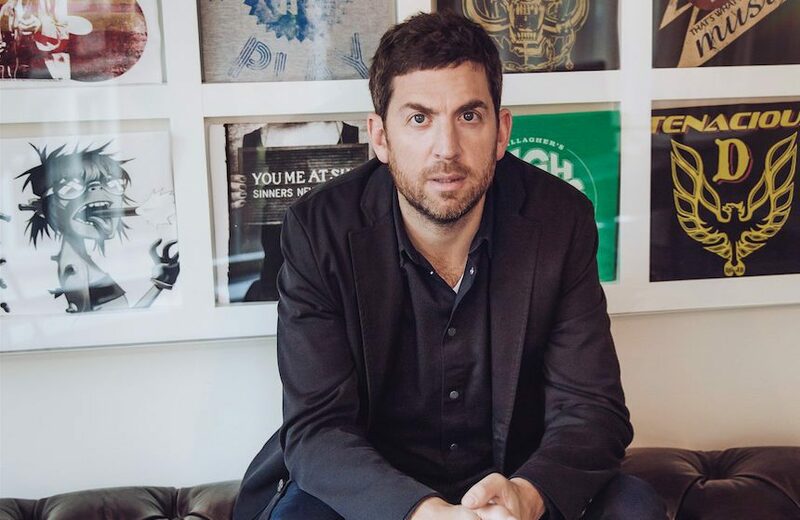 What has it been like since Max Lousada was elevated to global boss of labels at Warner? 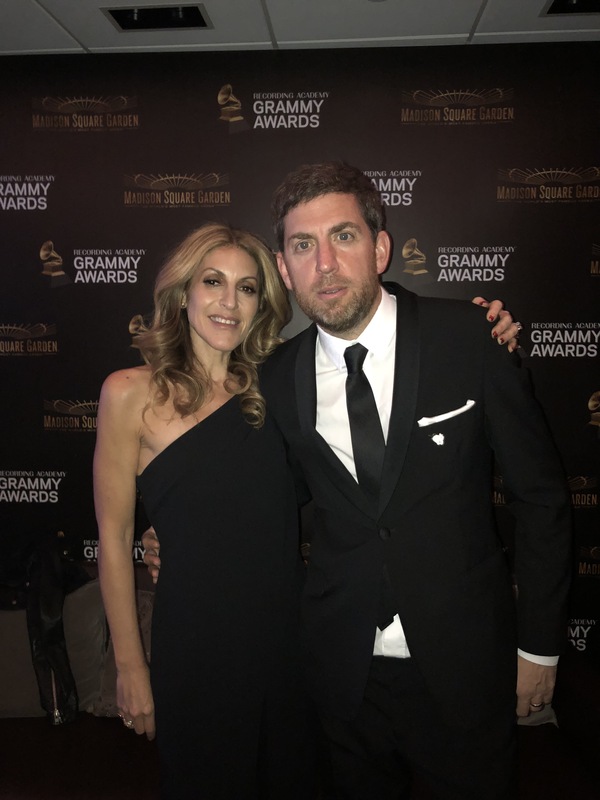 Craig: Fortunately, Julie and I together have worked with Max 14 years, as a true partner fighting it out with hand-to-hand combat on behalf of our artists in our respective countries. We’ve built up an incredible partnership, friendship and relationship. It’s fantastic to have him become our fearless leader. Max has completely killed it in each and every incarnation in his 16 years at Warner. Now we’re strategizing every day on how we do better, grow and make smart moves. Julie: Max knows exactly how hard it is to do what we do; he’s been right there with us in the foxhole. Now he’s stepping up and enabling us to focus our energy entirely on this label. We have bigger picture conversations and we’re super-collaborative with each other. Whether I’m talking to Ben [Cook at Atlantic UK], Phil [Christie at Warner Bros UK], Tom [Corson at Warner Bros in the US], Max is fostering this team mentality. It’s not Atlantic vs. Warner Bros vs. Parlophone – we’re all in it together. We’re locking arms with Max, and for Max. Can you top your banner 2017 in 2018? Julie: A Women Of The Year award, the Label Of The Year award, and then we get a sweep at the Grammys? Aren’t they supposed to retire me now? Where else can I go from here but down! [Laughs].